Much like with any fuel purchase – buying your wood pellets for the heating season can be a significant expense. That’s why we created the industry’s only savings plan specifically for wood pellets. 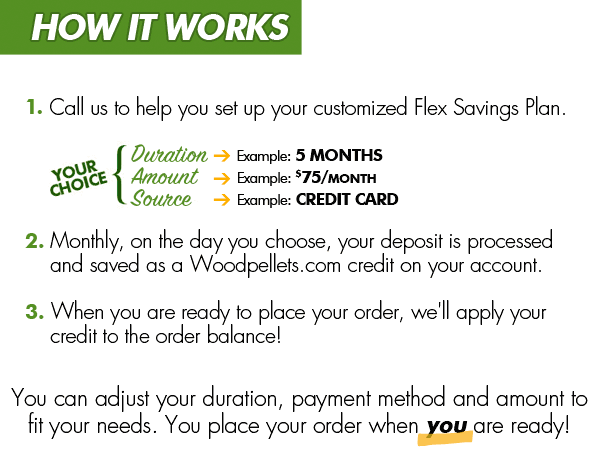 Our “Flex Savings Plan” makes saving for your wood pellets easier by enabling you to budget your fuel purchase over many months – instead of a single large one-time payment. Did you know that softwood pellets can be used as horse bedding? Horse bedding is used in stalls to absorb urine and moisture, and is a necessary part of properly maintaining clean stalls. Wood shavings are commonly used, but softwood pellet bedding is becoming popular among experienced horse and stable owners. Earlier this month, Woodpellets.com was proud to donate Cleanfire Pacific wood pellets to the NY-based nonprofit, Lucky Orphans Horse Rescue. Five years ago, Deanna Mancuso founded the LOHR in order to provide a sanctuary for unwanted, abused and neglected horses. But the mission of her team goes beyond rescue, rehabilitation and care – because the horses go on to help people. Lucky Orphans’ EAGALA certified team offers Equine Assisted Psychotherapy for those struggling with PTSD, anxiety, depression and other mental or emotional struggles. Deanna explained, “Donations like these wood pellets are really a donation to the community, because you’re helping the horses that are serving such a huge purpose in the community”.